Those of you who read the first part of this study would know that, noting certain differences between the Vulgate translation of Genesis 3:15 and other translations, I began to wonder if the Bible had been changed in order to impose a certain meaning upon the text. This brief comment from Jerome tells us a very great deal; first, it tells us that Jerome recognized the form of the noun “heel”, and of the preceding personal pronoun, to be masculine/neuter singular. Additionally, the comment demonstrates that although Jerome recognized the singular form in the Hebrew, his interpretation of its content corresponding to the word “seed” (i.e. the owner of the heel) to be a collective empowered by Christ. WHOA!! Wait a minute! St. Jerome DID change the text? He conceded his inaccuracy! And it seems he let it stand! What’s going on here? Let’s start with a little bit of context. As far as we know, St. Jerome’s translation of Genesis was the first translation of the book into Latin and the first translation of the book from the Hebrew by a Christian. Also important – the translation was happening in the late fourth century AD. What St. Jerome was doing was ground breaking to the extent that St. Augustine even expressed initial concern about not relying upon the Greek translation that was already available (the Septuagint) – many of the letters between St. Augustine and St. Jerome have been preserved that demonstrate a discussion at great length over the translations, and even over St. Jerome’s method – the use of asterisks and obelisks as codes for flagging discrepancies between the original Hebrew and the Septuagint translation… discrepancies very similar to that which we are investigating here! All of this historical context is going to help us next time when we tackle the idea of canon, and have a look at whether or not St. Jerome was doing something shady by translating the text as he did. _______ * St. Jerome. St Jerome’s Hebrew Questions on Genesis: Translated with an Introduction and Commentary by C.T.R. Hayward, NY: Oxford University Press, 1995. Reprinted in 2001. 33. Categories: Scripture, St. Augustine, St. Jerome | Tags: asterisks and obelisks, C.T.R. Hayward, canon, Genesis 3 15, Greek, Hebrew, Jerome has performed two operations on the sentence, seed of the woman, Septuagint, St Jerome, St Jerome's Hebrew Questions on Genesis, St. Augustine, translation, Vulgate | Permalink. 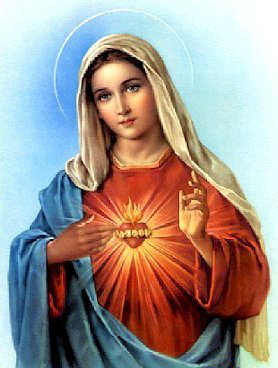 In honour of the celebration of the Immaculate Heart of Mary today, I thought I’d start a multi-part study of a passage in Scripture and the relationship it bears to the teaching on the Church about the role of Mary, Our Blessed Mother. Some time ago I was horrified to discover, when doing some personal study on Genesis 3:15, that there is a difference between the text in the Latin Vulgate (that translation of St. Jerome’s that Catholics had given pride of place for centuries) and a number of other translations. The reason for this was that the other translations I consulted were all taken either from the Greek translation of the original text (the Septuagint) or they were taken from the original Hebrew itself. At first I noticed the difference in just two other translations and thought that it was odd. I kept digging, examining half a dozen different translations before realizing that I couldn’t escape the truth – there was definitely something fishy going on here. and thy seed and her seed: she shall crush thy head, and thou shalt lie in wait for her heel. I started to feel anxious; in discussions about sola scriptura with my Protestant friends, I had often pointed out that Martin Luther had “doctored” the bible, adding the word “alone” so that he could impose a teaching that was not actually present in Scripture. This, in my view, compromised the very integrity of the doctrine it was supposed to uphold. No-one could argue that this DIDN’T happen, for Luther himself admits to it in a letter to a friend of his, and this is all very well-documented and well-known. Now, it seemed, I was facing the possibility that St. Jerome had done something very similar many, many years ago, and that this threatened the integrity of the Church’s teaching on the role of Mary, given the historical association of the concept of Mediatrix with this passage. Who exactly is supposed to be doing the head-crushing here, after all? Is it the woman? Is it the woman’s offspring? WHO is the woman? Categories: Scripture | Tags: Biblical Greek, Biblical Hebrew, consequences of The Fall, Douay-Rheims, enmity between you and the woman, exegesis, Garden, Gen 3 15, Genesis 3 15, he shall bruise your head, Luther doctored the bible, Marian doctrine, Martin Luther, Septuagint, she shall crush thy head, sola scriptura, St Jerome, thou shalt lie in wait for her heel, Vulgate, you shall bruise his heel | Permalink. In my time zone it is almost 2am on June 8th, and the Solemnity of the Sacred Heart of Jesus has passed. On the other side of the International Date Line, however, this beautiful Solemnity is still being marked and it is with that in mind that I post this however belatedly. Leave it to a night owl like me to let one day roll into the next! I didn’t realize until recently that 114 years ago the entire human race was dedicated to the Sacred Heart of Jesus by Pope Leo XIII. Not sure about you, but I find that intensely beautiful. Contemplation of the Heart of Jesus in the Eucharist will spur the faithful to seek in that Heart the inexhaustible mystery of the priesthood of Christ and of the Church. It will enable them to taste, in communion with their brothers and sisters, the spiritual sweetness of charity at its very source. By helping all to rediscover their own Baptism, it will make them more aware of having to live their apostolic dimension by spreading love and participating in the mission of evangelization. In this milieu, 14 years on from the writing of this letter, it is perhaps valuable to consider the contemplation of the Heart of Jesus as a being central element to the New Evangelization, too. I hope those of you who read Pope John Paul II’s letter for the first time enjoy it and ponder it and find yourselves drawn more deeply into the Sacred Heart of Our Lord. Categories: Jesus Christ, Pope John Paul II, Pope Leo XIII | Tags: Baptism, contemplation, dedication of the world, evangelization, International Date Line, letter to the faithful, New Evangelization, night owl, Pope John Paul II, Pope Leo XIII, Sacred Heart of Jesus, Solemnity | Permalink. Categories: internet, technology | Permalink. Taking all things and rendering them unto Christ… thank you to all who make cyberspace a place where the Lord can work in us! I found out last night that my grandmother had been diagnosed with cancer, and that due to her heart condition, her pacemaker and the advanced state of some other health complications, the usual avenues of treatment were possibly not open to her. I tweeted a very simple prayer request. Less than 2 minutes later I had an overwhelming number of responses and retweets popping up from not just the people who follow me, but from people who follow people who follow me, people I have no connection with whatsoever. I was just overwhelmed at the Body of Christ in action even in cyberspace. Electronic communities can never replace good, in-person human relationships. But where electronic connections DO exist, it is a beautiful thing to see that they are being used to further the Kingdom. We hear a lot about cyber-bulling and other negatives. I thought it was heart-warming to see that much good can also be achieved in an online setting. Blessed be God! And thank you to all who pray for my grandmother. I ask that the Lord bless you even as He blesses her. Categories: Scripture | Tags: Body of Christ, Catholic culture, cyberspace, gratitude, Kingdom of God, love, prayer request, relationships | Permalink. My head wasn’t in the game today. When I parked my car this morning at 8am, having arrived in the city for work, I inadvertently left my headlights on. 12 hours later, upon my return to the car, the battery was as dead as a doornail. Tried to clutch start it – fail. Tonight was NOT my night. And now I was blocking the main thoroughfare. I put the hazard lights on, then I got out and proceeded to push. Let me put this into context for you. Everyone has their stuff to deal with so its no big deal in the grand scheme of things – but my particular stuff comes in the form of a health situation that is, at times, debilitating. As it was, I had literally been unable to stand upright all day. Luckily I have a job where I mostly remain seated. On the odd occasion when I got up, I had plenty of walls and tables to hold me up as I got where I needed to go. Anyway… pushing a car unassisted in this state was a BIG ask. Eventually I got the car to go where I wanted it to go and managed to park it out of anyone else’s way. I went in to the shopping centre and spent money that I couldn’t really spare this week… no, not retail therapy! A car battery. I managed to spill battery acid all over my work clothes, of course. My night was just beginning. Now gentlemen – I really need to remind you – when you tighten any kind of bolt, you tighten it as far as it reasonably goes without pushing it too far, then you LOOSEN it by a quarter-turn. Doesn’t EVERYONE know that? Whatever tough-guy tightened the bolts that fastened the car battery terminals to the contact points caused me to lose several hours that I just wont get back! Why? I was fighting with the bolts, and the sediment that encrusted them, and I was doing it with an old-school spanner. No folks – no ratchet for me. I was not at all that well equipped. I sat there struggling with it for ages, making every effort for the spanner not to touch any other metal point on the car whilst working on the positive terminal, so as not to jolt myself to high heaven. EVENTUALLY I got the bolts loose. As this happened, a couple passed me in their 4WD and offered to put me out of my misery. I was managing just fine, mind you, and I was getting there… but I was getting there SLOWLY. I played “helpless maiden” and let the gentleman help me, most gratefully. He finished off the battery switch and I tested the engine. THEN I needed to call home and explain why I was 3 hours late for dinner. But now my PHONE decided to die on me. Luckily, my inner Maxwell Smart compels me to carry a spare cell phone for just such an occasion. I pulled off my hoop earring from one ear and used the post (about the thickness of a paperclip) to pop open the SIM compartment of my iPhone, switched the SIM into the spare phone and made the call. Given that I was ravenous and at this point needed protein lest I keel over, I informed Mum I’d grab food on the way. I did so… with engine grease and battery acid all over my hands. Let me tell you, chicken is NOT meant to be seasoned with that stuff! In other breaking news – I’m pretty sure I broke a nail. Categories: Scripture | Tags: battery, car, headlights | Permalink.